Clark has withdrawn with a ankle injury and Tracey were trimmed 24h before the match. Burns and Nicholls were 18th and 19th men. 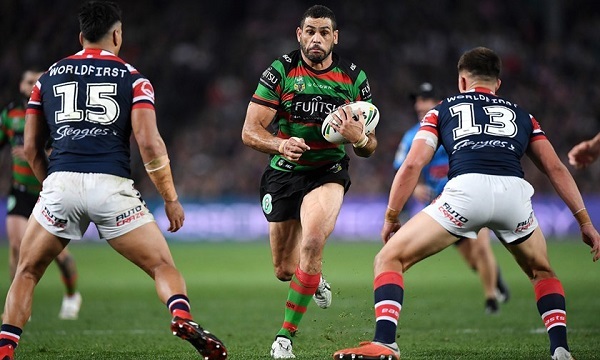 Rabbitohs have fallen short in Grand Final qualifier The three tries to none 12-4 loss to arch rivals Sydney Roosters had all the drama befitting the final game to be played at Allianz Stadium before the bulldozers move in. 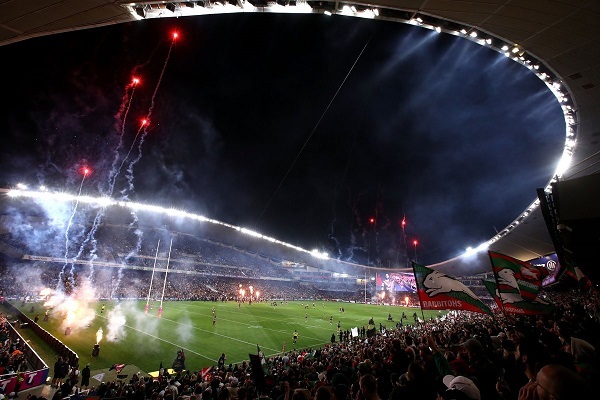 It was witnessed by the venue's largest crowd for a sporting event in 30 years – 44,380. Ball control and big hits was the order of the day early. Various combinations of the Burgess brothers forced the ball from Jared Waerea-Hargreaves and Paul Momirovski's grasps in a bruising opening 10 minutes. Souths took a early lead in the 13th minute with a long range penalty goal. Waerea-Hargreaves got one back when he forced George Burgess to knock-on from the re-start to a Reynolds penalty. The Roosters scored the only try in the first half (16th minute), from crisp passing by halves Cronk and Keary, fullback James Tedesco then added his own exclamation mark with a sublime cut-out pass for winger Daniel Tupou. Conversion was unsuccessful. 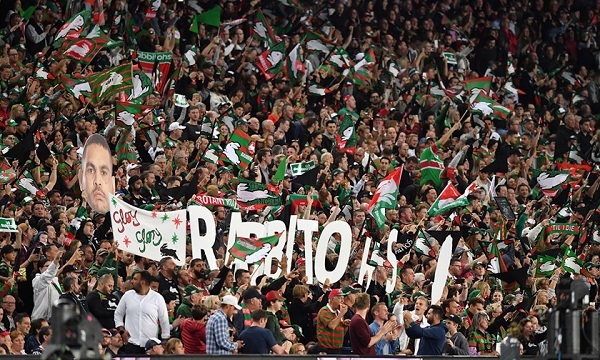 Within a few minutes Souths were again on the attack and only denied a try when the finalpass from Alex Johnston drifted forward as Robert Jennings crossed in the corner. Another error by the Roosters and morepressur from Souths saw a penalty awarded and Reynolds equalised in the 25th minute. Cronk tried to break the deadlock with that field goal attempt 20 seconds from the halftime siren, but it drifted slightly left. But then Daniel Tupou dropped the ball 10 metres out from the Roosters line, before Sam Burgess knocked on in a clumsy play-the-ball. It all contributed to 11 errors and eight penalties in total after 40 minutes. Scores were locked at 4-4 at the break. Cronk returned to the field in the second half but his left arm was still limp. He made a few tackles but couldn't kick the ball. Jake Friend kicked for touch on the fifth tackle – but it sailed out on the full – in the 42nd minute while Luke Keary kicked for the line in a penalty two minutes later, and took over end-of-set kicks. Passing to his left Cronk also had its difficulties with Cronk not able to get much distance. But he did figure in Blake Ferguson's 48th minute try, although it was the Roosters right-side winger that did the most work. He took an off-load from his centre Joseph Manu and then side-stepped two cover defenders to grab his side the lead 8-4. Again the conversion was missed. 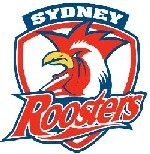 A late tackle by Junior Tatola brought Cronk to his knees and a penalty the Roosters way. Once again they missed at their shot at goal. But in the next set the Roosters put up a wellplaced bomb which was knocked on by Graham and gifted for Souths junior Momorski a simple try and take the score to 12-4 after again the conversion went wide, with 10 minutes on the clock. Souths put on some late attacking raids but nothing was working against the strong defence. A late penalty saw Raeynold go for a desperate penalty goal to bring the gap back to 6 points. But alas it went wide and the match ended at 4-12, with Souths bowing out of the finals race. All Souths points were by No.7 Adam Reynolds with two penalties. Handling errors were also a feature of the second half - 26 in total for the match. Inglis reflected on the finals exit. "Where we needed to be better was execution in attack. We didn't get to the right areas of the field we wanted to run our shapes from. "Probably we weren't the best version of ourselves tonight either so that's also what makes it disappointing."